Wakodahatchee Wetlands and nearby Green Cay Wetlands are excellent places to photograph birds. 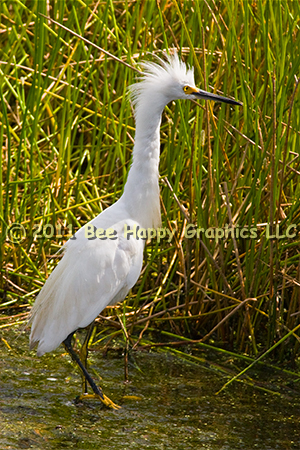 This is an adult snowy egret (Egretta thula), characterized by the black legs and yellow feet. The immature birds lack the plumes. In a breeding adult the plumes are longer, and in a high breeding adult the feet are orange. Photographic details: Canon EOS 30D camera w/ EF 100-400mm f/4.5-5.6L IS USM lens set at 400mm. Flash was not used. Camera was on f/14 for 1/640 sec (shutter priority, no exposure compensation) at ISO 800.